Markus presenting the Annals paper on extreme contexts at the R3 research seminar » Triple E.D. The R3 research group stands for Risk, Resilience and Reliability. It is a newly formed interdisciplinary network that currently is organized by Amy Fraher and Mark Hall at Birmingham University. 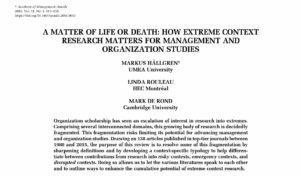 Markus was invited to present his and Linda Rouleau´s and Mark de Rond´s Annals paper on extreme contexts. It was a great seminar with plenty of interesting thoughts and discussions following presentations by senior and junior scholars alike. This entry was posted in Workshop and tagged extreme contexts. Bookmark the permalink.